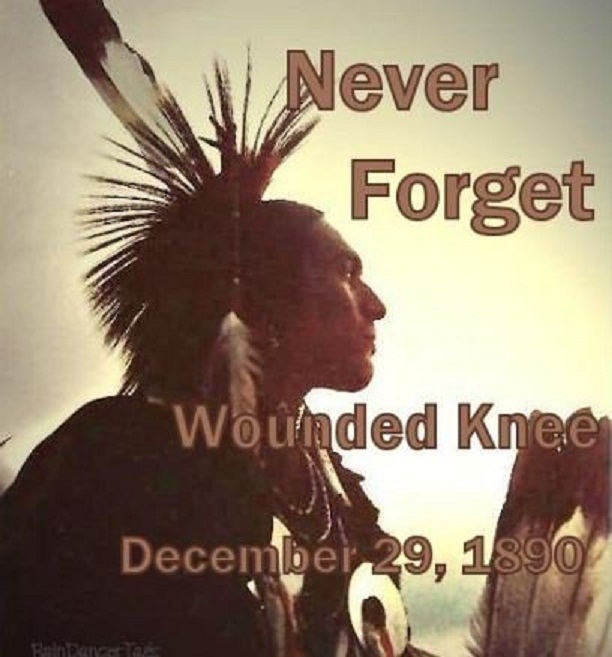 This week marks the 125th anniversary of the Wounded Knee Massacre in which an estimated 300 American Indian men, women, and children were killed near Wounded Knee Creek (Lakota: Čhaŋkpé Ópi Wakpála) in South Dakota. Having been confined to reservations, and the surrounding area having been completely depleted of buffalo, frustrations rose among the Sioux who began to organize in earnest through the Ghost Dance movement. In response, White military commanders began to crack down even harder on area tribes, violating the 1868 Treaty of Fort Laramie, which guaranteed peaceful relations between the United States and the Lakota nation. This escalation eventually led to the attempted arrest and killing of Chief Sitting Bull (Tȟatȟáŋka Íyotake) at Standing Rock Reservation on December 15. Thus, Chief Spotted Elk (Uŋpȟáŋ Glešká ; also known as Chief Big Foot) attempted to ensure the safety of those under his care by leading them to the Pine Ridge Reservation. However, they were intercepted. 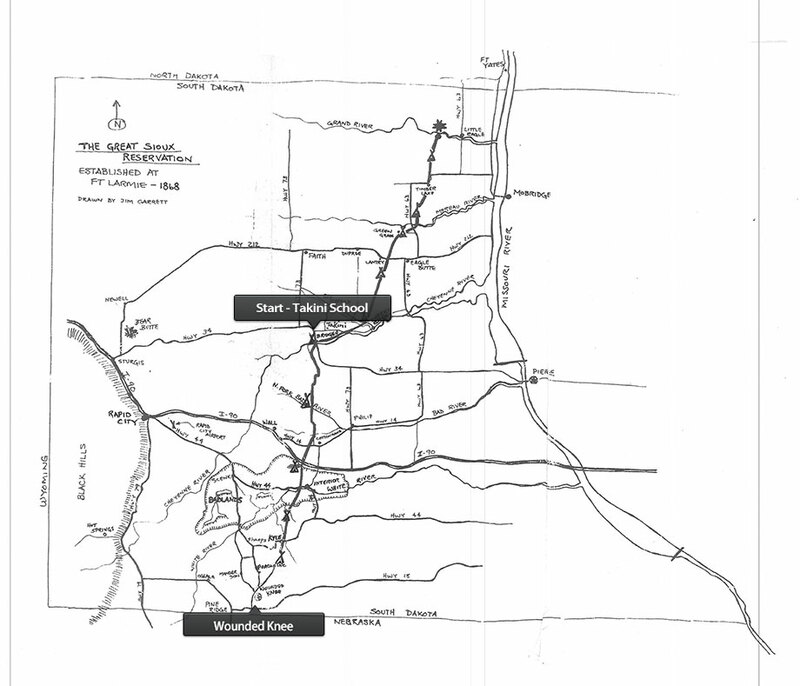 After stopping for the night at Wounded Knee, their encampment was surrounded by the U.S. 7th Cavalry under the command of Col. James W. Forsyth. In less than an hour, approximately 300 men, women, and children were killed, including Chief Spotted Elk, effectively putting an end to the Ghost Dance movement. Having witnessed the scene in an attempt to rescue the wounded, Black Elk (Heȟáka Sápa) later recalled that “something else died there in the bloody mud, and was buried in the blizzard. A people's dream died there. It was a beautiful dream ... the nation's hope is broken and scattered. There is no center any longer, and the sacred tree is dead" (find more reactions and eyewitness accounts here). In contrast, Colonel Forsyth was eventually promoted to Major General and twenty soldiers were awarded the Medal of Honor. The Lakota nation has protested these as ‘Medals of Dishonor’ calling the U.S. Government to rescind them, but no such action has been taken. Individuals have also sought reparations from the Federal Government for the loss of life and property at Wounded Knee, but have been blocked due to their being classified as “hostiles” and thus ineligible for compensation. Of note, the site has continued to be of symbolic significance in the struggle against oppression. Beginning on February 27, 1973, Wounded Knee was chosen as the protest site for what would be a 71-day standoff between American Indian Movement (AIM) and the FBI. The American Indian Movement was formed to stop police harassment of Indians, among other issues. The AIM eventually won national attention for the U.S. Government’s mistreatment of American Indians that continued through the 20th century, and indeed persists today. 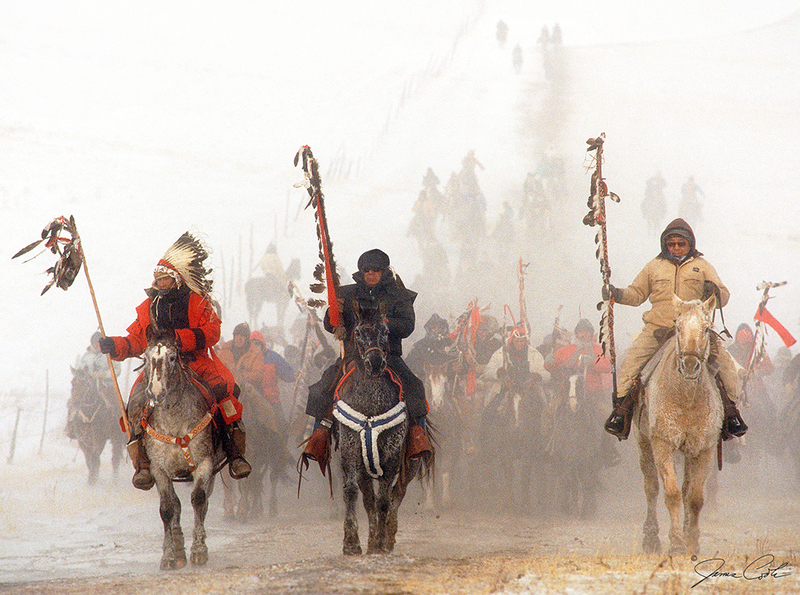 Each year to mark the anniversary of the Massacre at Wounded Knee, indigenous peoples led by the Lakota nation set out on the Big Foot Band Memorial Ride. 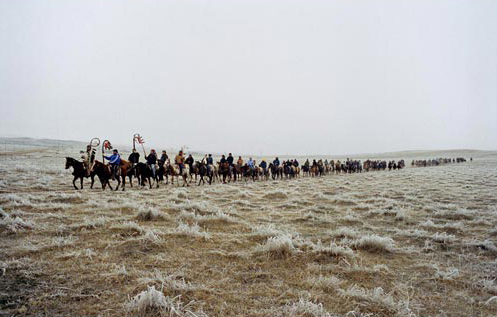 Participants travel on horseback and on foot through the snow on an eight-day ride, culminating in a ceremony to help heal the scars of war and death and raise awareness against genocide. This memorial ride has taken place every year for the past 25 years, and on this 125th anniversary of the massacre, organizers expect hundreds to join the ride in support. They are currently on their journey and invite each of us to pause on December 29th at 12:00 noon in your local time, all around the world in prayer and remembrance. In addition to your prayers and commemoration, you can support the riders with your monetary contribution. It costs about $300 per participant to cover lodging, suppose, and safety precautions. Every little bit helps keep the movement and the memory alive.